CSR is a question of prestige in the business of companies that care about their reputation. UniCredit bases its own business philosophy and social responsibility on a value defined as INTEGRITY. What does integrity mean in terms of CSR? – By definition, integrity in terms of CSR can be described as voluntary and consistent adherence to a set of human characteristics and values that are applied to all facets of business operations. UniCredit Group’s value system is based on integrity as a condition of sustainability, which makes it possible to transform profit into value for our people, customers, investors, local communities and the whole of the society with which the corporation strives to be on good terms. For us, integrity means identifying with a set of strong and shared values, which must influence our daily behaviour and help create a perceived reputation on the market. For us, being sustainable in the long term means “to do our job well”. To do our job well means working according to the values identified and applying them in our daily behaviour. Every company has the primary goal of generating profit. Why have you decided that corporate social responsibility is an integral part of your business philosophy? – Given our pivotal position in the value chain, we take care to carefully consider the impacts of our operations – we are always conscious of the major role we play in the economies of the local communities where we operate. We adopt a responsible approach in all our activities, whether they are typical banking operations or corporate citizenship initiatives focused on such topics as inclusion and financial education, or philanthropic activities in support of social inclusion. We believe strongly that when communities are able to offer a diverse range of opportunities they are the best facilitators for the development and growth of their members and businesses. Social responsibility is a fairly broad concept. UniCredit Bank has decided to invest in the local communities where it operates, support youth, vulnerable sectors of the population, culture and the youngest in sports. Which criteria form the basis for you to select priorities in this area? – We changed our CSR Strategy two years ago from only philanthropic to predominantly employee engagement. Why did we do that? First of all because human capital is the main asset of UniCredit Bank. In accordance with that, we realised that we can provide added value to the society that can be used in the long term – the knowledge and expertise of our employees. Moreover, we wanted to involve employees in everything we do for local communities, in order to raise their awareness about the importance of being a responsible citizen. We have to say that the results of changing the bank’s orientation have been fantastic. We have managed to engage almost 50% of employees in different activities. UniCredit Bank joined activities implemented by the organisation Junior Achievements in Serbia. 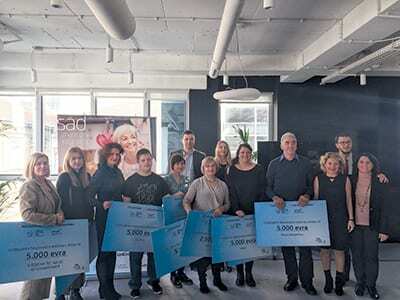 In the last two years, over 60 employees participated as mentors and jurors in more than 10 “Business Challenge” competitions and helped nearly 300 high school students to develop business plans. One of our colleagues was declared ‘Best Mentor’ for the entire 2016 edition of the competition. Additionally, we also organised volunteering activities involving the arranging of the yards of various schools in four regions of our branch network. The results of our teamwork can be seen in schools in Pirot, Novi Pazar, Zrenjanin and the Gerontological Centre in Belgrade. With these initiatives, we not only showed our commitment to local communities, but also additionally reinforced our team spirit, which undoubtedly improved relations among us and influenced the achieving of a better business performance. There is also another initiative we are very proud of and which we have been conducting for almost 10 years, and that is the humanitarian initiative “Old doll for a new smile”. During December we invite our employees and their kids to pack their used toys and clothes and send them to children living with mental disabilities who are cared for in foster homes. In this way we engage entire families in sharing in the joy of giving. Moreover, we also included families in our CSR activities this spring – we invited them to participate at the Humanitarian Fun Run during the Belgrade Marathon. Thanks to their high involvement, UniCredit Bank was able to donate significant financial resources to BelHospice. We are also proud of the eight years of continuous support provided by UniCredit Bank to traditional events with a cultural character and significant importance for local communities, such as the Days of Bora Stanković, Days of Zoran Radmilović and Days of Mokranjac events. There are also various UniCredit Group initiatives that we support at the local level, such as the Gift Matching Programme – the biggest initiative of the UniCredit Foundation, which encourages employees in their charitable commitments and matches their donations by doubling them. Which project would you consider particularly important in terms of its effect on the company, but also from the perspective of your company? – Since 2012, UniCredit Bank and UniCredit Foundation have been supporting the development of social entrepreneurship in Serbia though the competition ‘Idea for a Better Tomorrow’. We have so far granted over €100,000 to 16 ideas for products that can improve the image of Serbia in the region and worldwide. This year we launched the third edition, within which we have already selected the seven best ideas that will receive grants in the coming period totalling €40,000 and that will participate in the mentorship programme, in order to ensure they become successful and sustainable businesses. 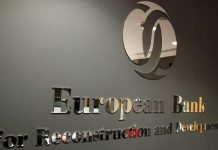 When we look at the results enabled by the first two editions, there are 40 representatives of social enterprises involved in skills development programmes, 35 new jobs created, which had a positive impact on more than 200 family members and at least 800 people from local communities who benefitted as clients and/or suppliers. In addition, UniCredit Bank continuously supports beneficiaries from all editions. For example, we provide them with catering for various events, buy their products as New Year’s presents for our clients, as well as presenting their business ideas as best practice examples on the local market to both our colleagues from the Group and our clients. With the end of 2017 fast approaching, what specific CSR plans do you have for 2018? 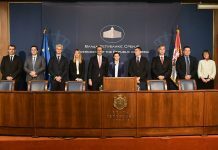 – As mentioned before, we are strongly committed to the development of local communities at various levels, thus also in 2018 we will continue to implement different activities that can contribute to improving living conditions in local communities, while at the same time we will work on additionally engaging employees in projects of broader social significance. The proof that we are on the right track and shouldn’t change our CSR strategy is provided by our employees, who are already contacting us and proposing different volunteering activities for the next year.